In every serving of this supplement, you get 50 grams of protein and creatine, glutamine and glutamic acid to fuel your hard working muscles and for a faster muscle recovery. Along with fulfilling 100% of your daily protein requirement, it also gives you 1250 calories and a massive 252g of carbs per serving so that you gain dense slabs of muscle mass. Enriched with 25 vital nutrients, it fuflills your body's nutritional requirement, keeping you focused on your fitness goals. Other key energy accelerators like creatine and glutamine give you intense burst of energy, reduce catabolism and speed up your recovery phase post-workout. Serious weight gain goals require serious calories. Unfortunately, those who need the extra calories most often have a hard time consuming enough of them. For many aspiring to be bigger, a highly- active metabolism, weaker appetite and on-the-run lifestyle can make it a real challenge to get enough calories from food. 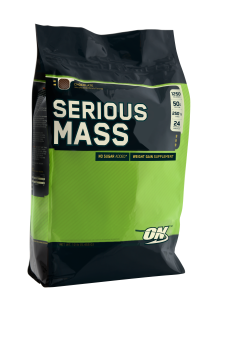 With 1,250 calories and 50 grams of protein per serving, you’ve got lots to gain from ON’s Serious Mass. Get serious about your sizable ambitions with Serious Mass. 1,250 calories per serving mixed with water and 1,640 calories when blended into low-fat milk. Over 250 grams of carbohydrates to fuel intense workouts & help replenish glycogen stores – with no sugar added. Includes 25 Vitamins & Minerals, Creatine, Glutamine & MCTs.